C﻿urriculum… curriculum… school books, desks, pencils & crayons… Okay, now for the …curriculum. Some moms go for the textbooks that remind them of their school days. Why not? They are familiar, colorful, flashy… They usually have scripted teachers manuals. Mom says this, child does that… Read pages x-z and do workbook pages a, b, & c. Simple. To the point. Several companies now even have DVD or online classes with a teacher in front of a wipe off board or display thingy of some sort. They often provide accreditation, report cards & diplomas. Some even have email & chat sessions for your children to ask the instructor questions. Lots of bells & whistles to make this look like the way to go. ﻿If you have children you really think will be attending college to become lawyers or doctors and your husband feels academics are a high priority in your home, this may very well be what your family needs. Some snazzy textbooks are from Bob Jones﻿ & Abeka. Christian Liberty Press is a great company which emphasizes patriotism. We have used some of their “Christian Liberty Nature Readers” and have really enjoyed them. We have also used some of the Mott Media books, reprinted from the books our great-grandparents used. I just think they are really neat… Our oldest thought the stories were too tragic and sad though. We do use the Rod & Staff readers for 1st through 4th grade, because they go through the Bible. I’ve wanted my children to have a firm foundation in Bible, and this is a good one. They are a Mennonite company, so the pictures have a sweet old-fashioned look to them. We've used the workbooks for 1st grade, because they have fun cut & paste projects. Unfortunately textbooks tend to be expensive and very time-consuming for mom. One subject at a time, one child at a time can become tiring. The texts are also updated often, making it hard to use for more children in a row. The new workbooks will be for the most recently updated text, rather than the one you may have already bought. If you have an older child whom you have pulled out of the institutional schools, you may benefit by worktexts. These are workbook and textbook all in one. They are similar to what your child is used to and simple for mom to keep up with. 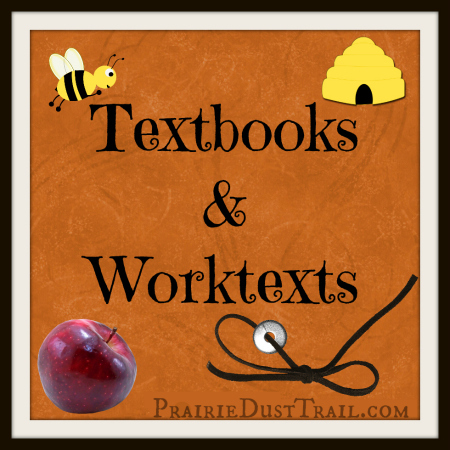 Typically there is a worktext for each subject and the child is required to read a page or two and answer one or two pages of questions per subject. These sound easy, but they tend to seem tedious and boring for most children and require lots of parental time during the younger years. Work-texts can be found from Christian Light Publications, and ﻿Alpha and Omega﻿ which also has “Switched on Schoolhouse” for the computer. Some families really tend to get stressed when life gets in the way and they fall behind on textbooks or work texts. If this is the approach you decide for your homeschool, please remember you don’t have to complete every single problem on every single page. I honestly don’t remember finishing a textbook in school, ever. I also remember often only having to do the odd or even-numbered problems, and sometimes even skipping around in a book. Please be flexible. Pray, Pray, Pray every single day.